Shares in Apple have surged more than 10% on Wall Street, lifted by strong earnings and robust sales. Late on Wednesday Apple revealed that profits for the three months to December more than quadrupled to $295m (£156m) from $63m in 2003. The news prompted a string of broker upgrades and with Tuesday's release of its new low cost iPod, buoyed hopes of strong profits in the current quarter. By 1600 GMT on Thursday, shares in the group were $6.78 higher at $72.19. Analysts cited the so-called "halo effect" - belief that rising iPod demand would translate into higher sales of its Apple Macintosh personal computers. "(We) believe that Apple can grow its consumer share," Bank of America Securities analyst Keith Bachman said in a note to clients. "Our survey work indicates strong brand appeal and interest in converting from Windows systems to Macs based on better media capabilities and virus protection." In Apple's results - the highest quarterly figures in its history - the group's sales jumped 75% to $3.49bn, from $2bn a year ago, driven by a surge in iPod sales and the growing popularity of its iBook laptop computer. Looking ahead, it forecasts sales of about $2.9bn for the first three months of 2005. 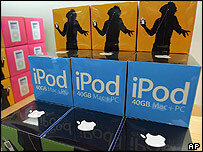 The company said it has now sold more than 10 million iPods, with almost half made in the run up to Christmas. "I think this momentum that happened last year is going to continue," said Owen Fitzpatrick, at Deutsche Bank. "Apple is a name in technology that at least for the next couple of quarters will have the wind at its back." On Tuesday Apple launched a cheap version of its Macintosh PC, as well as a new low-cost iPod. The success of the iPod, which first went on sale in 2001, has helped revitalise Apple's stock price and the company says it now has a 65% share of the hard drive-based portable music market. Apple said it sold 4.58 million iPods in the first quarter, compared with 2 million in the previous quarter. Its iTunes music download store is also the market leader and although it now faces strong competition from the likes of MSN and Napster, has helped the Apple brand. The company, which is bidding to increase its market share of the US PC market from a current 3%, said it had sold more than 1 million computers in the quarter. Company executives are hoping fans of the iPod will be wooed away from PCs running Microsoft's Windows operating system.